Collect blood samples from patients. Accurately label samples to identify the patient (to prevent any lab mix-ups). Determine the best way to draw blood from the patient. Take the blood to the lab. If allowed/required, centrifuge the vial of blood. Be friendly and empathetic. You may be working with sick or scared patients. Stay organized, and follow safety protocols. You’re working with blood, which has the potential to carry risks. You’ll usually find a job in a hospital, doctor’s office, blood donor center, or clinic. Most of your peers work full time, and very often on holidays and weekends, depending on where employed. 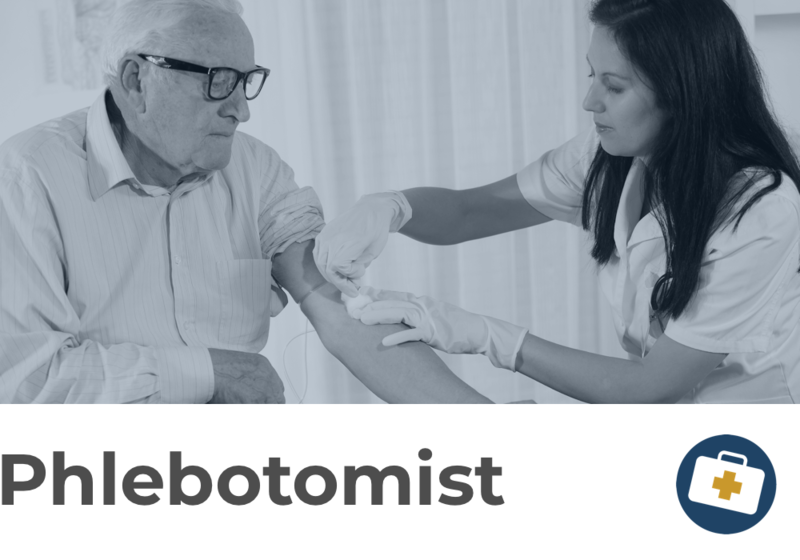 There are a few requirements that need to be fulfilled before you can start your work as a phlebotomist. Phlebotomy is an entry-level job within the medical field, but it sets the groundwork for become a registered nurse or beyond! Find a local phlebotomy school now. You’ll need your high school diploma or GED. Enroll and complete an accredited phlebotomy training program through a community college or trade school. Your training will take less than a year to complete and will include both classroom and hands-on experience. In some instances, you can find on-the-job training. Get your license and certification so you’re more desirable to employers. California, Louisiana, Nevada, and Washington require certification, and licensing is required. Otherwise, licensing and certification requirements vary by where you’ll work. Find a job as a phlebotomist at a medical practice, hospital, clinic, or medical lab. One of the greatest soft skills you’ll need to be a successful phlebotomist is compassion. After that, hand-eye coordination and dexterity are both important skills. Certifications are available through the National Center for Competency Testing, National Healthcareer Association, the American Society for Clinical Pathology, the National Phlebotomy Association, and the American Medical Technologists. There are going to be moments throughout your day that you’ll be exceptionally busy and on your feet, especially during any type of health emergency. You’re looking at a median annual salary of more than $33K once you’ve gained experience and put in a couple of years. Your entry-level salary will average over $24K, but when you’ve reached the peak of your career, you’ll be making more than $48K. The top paying industries for phlebotomy are outpatient care centers, medical and diagnostic labs, and other ambulatory care centers. There will be over 30K new positions opening through 2026, which shows the career of phlebotomy is going to experience significant growth and need. Your job prospects will increase if you’ve received certification through one of the certifying organizations.